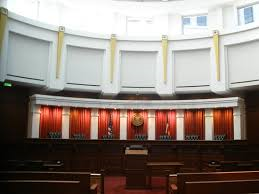 Please join the RMHUC on Monday, February 25 from 9:00 - 10:30 am for a special guided tour of the Ralph L. Carr Colorado Judicial Center, which houses, among other things, the Colorado Supreme Court, the Colorado Court of Appeals, the Colorado Supreme Court Library, and the Colorado Judicial Learning Center, a 4000-square foot fun and interactive learning environment designed to build awareness, understanding, and appreciation for the rule of law and the role of the Judicial Branch in our society. 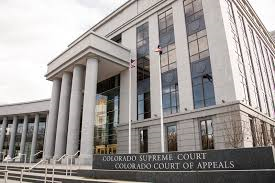 The tour, which will last about an hour, will include a visit to one or more courtrooms (if available), discussion about the Colorado court system, a tour of the building and its public art, a visit to the Supreme Court Library, and some time in the Judicial Learning Center. 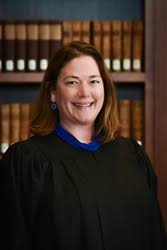 Following the tour, Colorado Supreme Court Justice Melissa Hart (AB '91, JD '95) will join us in the Supreme Court courtroom for a 30-minute Q&A session to answer questions about the Colorado judicial system, the work of the Supreme Court, and other topics of interest to the group. This event is free! However, we do need RSVPs by February 20 so we can get an accurate headcount for the tour. Non-alumni guests and children are also welcome to join us, but please RSVP for them. If you RSVP but later learn you will be unable to attend, please let us know. Instructions for attendees: Attendees will meet shortly before 9 am in the atrium on the north side of the building (the East 14th Avenue side), just after entering through security. If you have any questions, please feel free to call Christina Gomez at 720-231-0746.